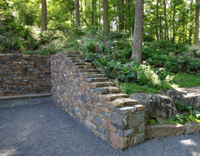 Walls: Fieldstone is an appropriate choice for this interesting stepped wall in Pennsylvania and enhances the naturalistic character of the site. If it had been a wall built in New Mexico, for example, an smooth adobe wall would be more fitting. Walls may or may not be functional, but tend to lend a pleasing sense of enclosure to a space, as well. 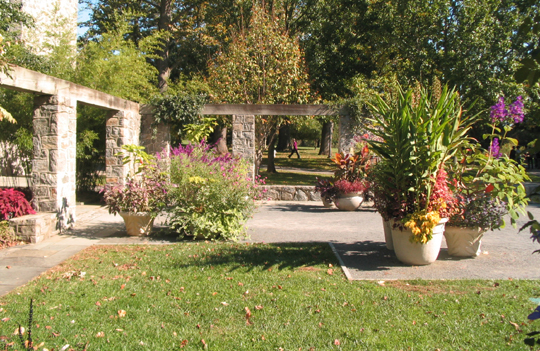 Arbors: Creating a gateway into a space can be achieved with the use of an arbor, whether it be constructed of lumber, metal or living plants, the latter two pictured here. Native climbing plants and vines can be used to soften the lines of, and provide shade beneath, a more traditional wood arbor. Fences: Whether you need to add privacy or just architectural interest, a fence can define a space to create separate garden rooms. 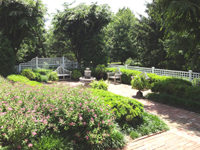 This fence adheres to the traditional, formal feel of the property. Read my previous post here for eco-friendly fence options made from composite materials. 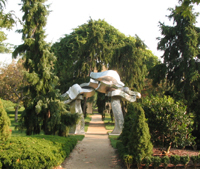 Sculpture: What garden would be complete without a focal point, such as a sculpture at the end of a pathway or in a special part of the garden? 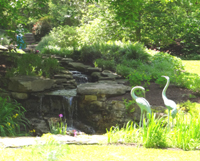 Adding a piece of art can create a certain ambiance too, such as whimsy or formality, to the garden. Read my previous post here to get inspiration by visiting a sculpture park near you. 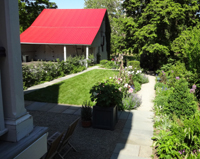 Buildings: The side of a building can help define an outdoor space. The sides of this historic barn aid in defining three separate garden rooms. The old barn provides a cohesive backdrop to each garden room, yet enables each space to have its own unique character. Plants: Some plants are more architectural than others and can be used to create a living wall or naturalistic focal point, as well as define the edges of a garden. 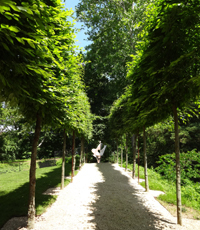 This allée of espaliered native trees draws the eye toward a sculptural element at the end of the path.